I would like to announce right here at the beginning of this post, that I have not purchased a single piece of fabric so far this year . . . yet. Part of my success so far is that I’m not much of an online shopper, and I haven’t really gone anywhere because of the crappy weather. I’m trying to keep it cleaned off as I go, but I’ve also decided that I will clean it off on the first day of every month, so that I can keep it relatively clean all the time. Naturally, if I’m working, it’s gonna get piled with stuff — it’s the little extras that creep in that need to be taken care of. It’s a flat surface, so it’s very handy to just turn it into a dumping ground for things that I haven’t made a decision about. My plan is to make those decisions more often, so that it doesn’t get and stay in such a mess. Baby steps, right? I can also see that I need to attend to the pile on the end of the ironing board — it’s a sickness, this pile-making . 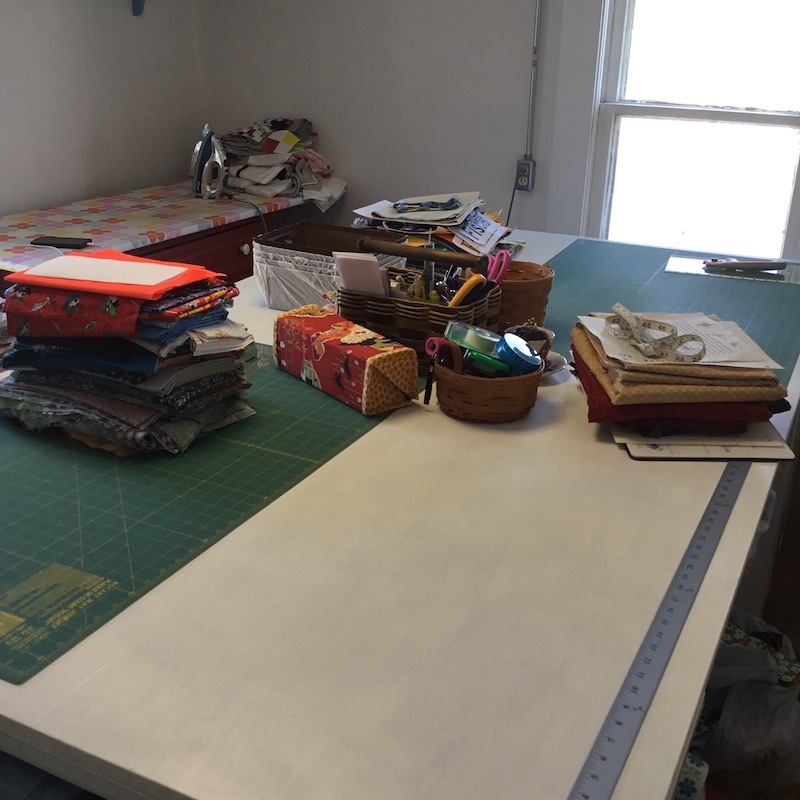 . .
Over the weekend, I made another big mess on the cutting table because I was making a birthday gift for my sister. 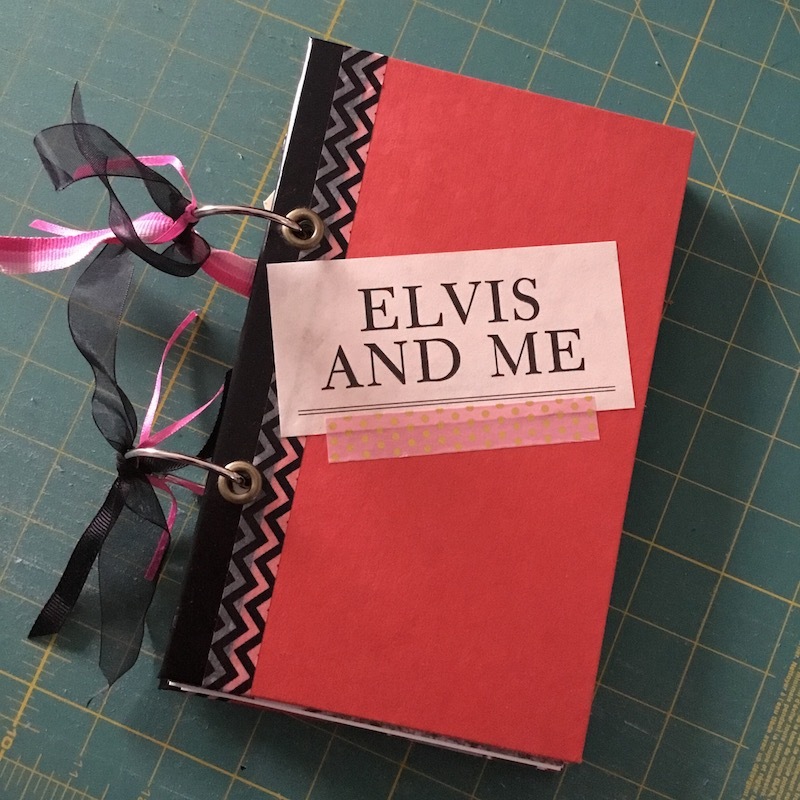 Totally not a quilting project, I made her this Elvis Junk Journal, since she’s the biggest Elvis fan I know. 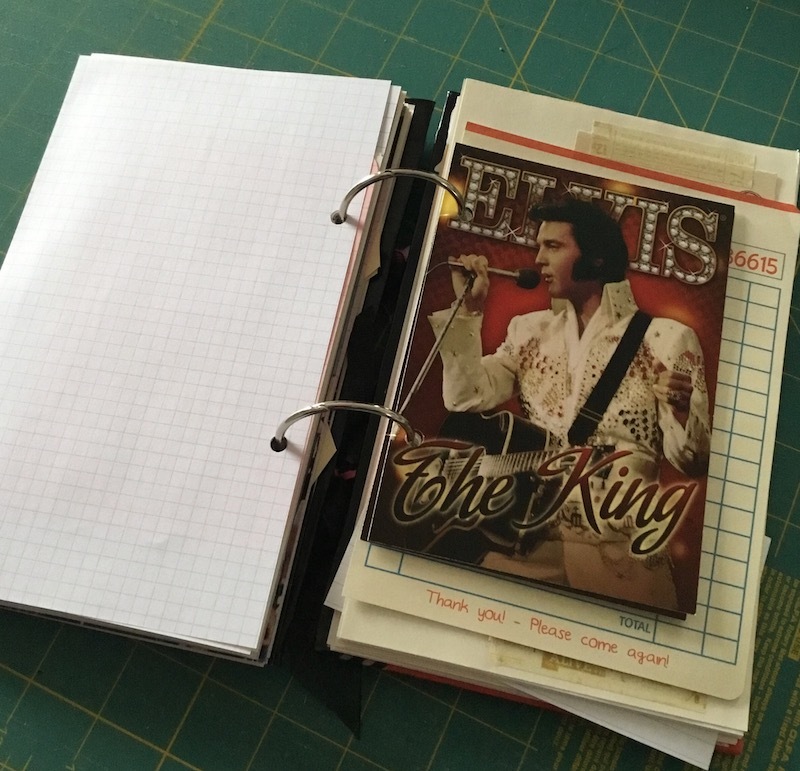 Now she has a book to keep her ticket stubs, VIP passes, and other Graceland mementos in, all in one handy cute place. I also made her this zipper pouch. 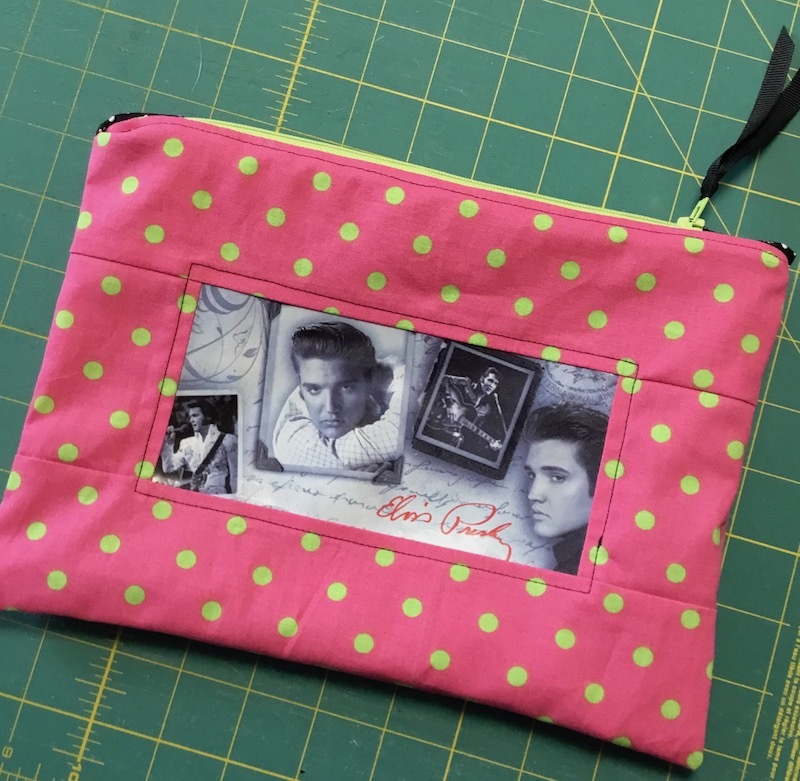 She bought me an Elvis wallet a few years ago, and I used it till it fell completely apart, and when it did, I saved the outer panels of it, and turned them into this pouch for her! While I had it in my mind that it would be an all-day affair, in reality, it only took me less than 2 hours to clean it all up! Why do I blow tasks out of proportion so in my head? It seriously keeps me from getting a lot more done. And that 2 hours included measuring all the scrap pieces of batting, making labels for them, sorting them by size, and storing them back in the closet! Now when I need a small piece of batting for something, I’ll know right where to look and they’re all labeled, so I can find what I need quickly. The trick will be to keep doing this and not let it get out of control again, either, just like the cutting table . . . The rolls are another story. They’ll have to stay out in plain sight for a while longer. Have you ever heard me griping about how silly it is that every closet in this house opens INWARD???? You can’t put ANYthing in the front half of any closet, or you can’t get the door open or shut. So the closet is really only half full, while if the silly door opened into the room, I could also store all those rolls out of sight. I’m still debating whether to worry about having all the doors turned around, but we have bigger remodeling fish to fry right now, so even if I get around to that at some point, it’s gonna be awhile. So I’ll just keep griping about it for now — haha! I’m trying to see it as a positive thing — it keeps me from junking up the closets and inspires me to have less stuff — maybe I shouldn’t ever turn the doors around! What do you think? While I haven’t purchased any fabric, I was gifted this piece by my sister. It’s perfect for me! 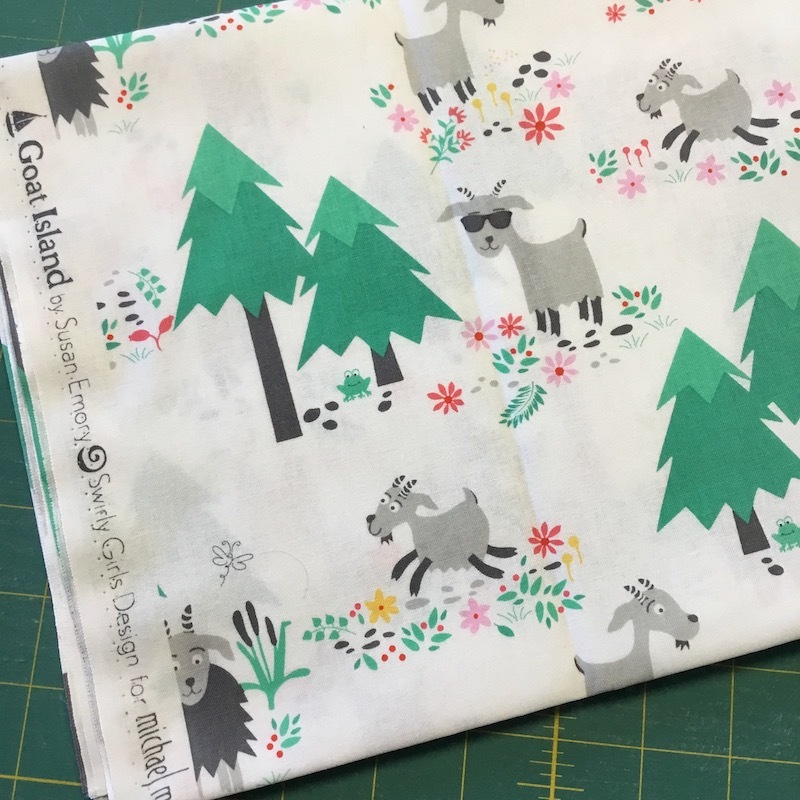 Goat fabric! I’ll have to dream up something Ranger-inspired to make with it. Speaking of Ranger, here he is! 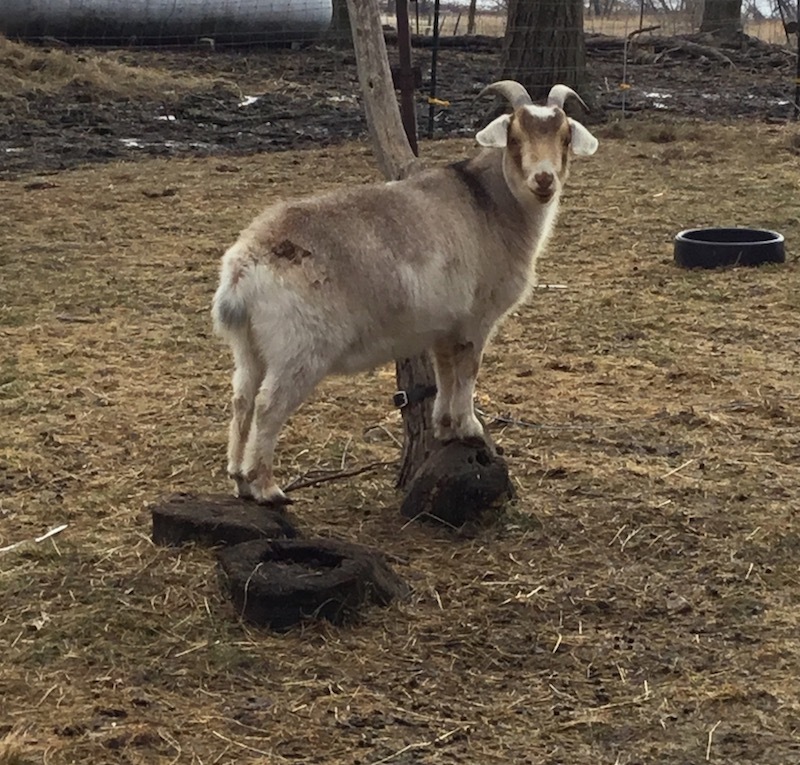 It looks like he’s trying to avoid getting his feet muddy, but in reality, he just likes standing on things like that. I love him so much! And I’ve started blogging over at The Life of Hazel Ilene again. There’s a new Quilt-along (and a lot more fun stuff) coming very soon. I know, I know, I’ve been promising that for over a year, but this time, it’s for real! So go check it out in your spare time — you might wanna join in! Quilting is just inherently messy. It expands to fill up as much space as we allow it. I am trying to get more dusipline about trimming my leftover pieces into usable sizes right away instead of putting them in a pile at the end of the table. Nice job keeping things from getting totally out of control again! 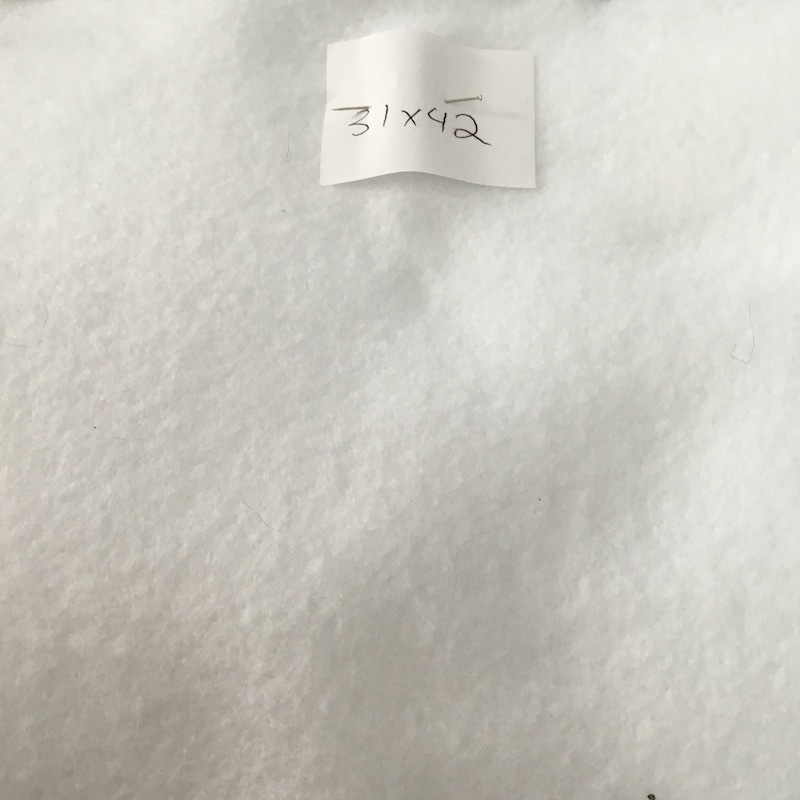 I also label my batting pieces…started doing that when I got tired of remeasuring them every couple of weeks. Suggestion – Even though it wouldn’t look as nice as having the door closed, perhaps you could take the door off and lean it against the inside wall of the closet. You would then have room for your bolts of batting. Good luck. I also wish I could say I haven’t bought any new fabric, but Missouri Star had an end of bolt sale a couple weekend ago when I was coming home from Colorado, and had Kona solids, batiks, grunge, indigo, and others on sale. The catch was the fabric was $3/yard, but you had to buy the whole EOB. Some of them were still wrapped in plastic and were considered overstock, so 15 yards of grunge/Kona, Indigo, Batiks at $3/yard, “Yes, please, thank you very much, I’ll take the bolt!” I scored a HUGE deal, but wow, that is a lot of fabric I came home with! I have purchased some new fabric. . . but it was project specific and is, mostly, already used so that is a good thing. About your doors, or at least the one in the long arm room; would it be feasible to remove the door and perhaps put a pretty sheet on a hanger over the top of the door frame so that more of the closet would be used? Just a thought. I have never heard of closet doors that open inward. Great work! 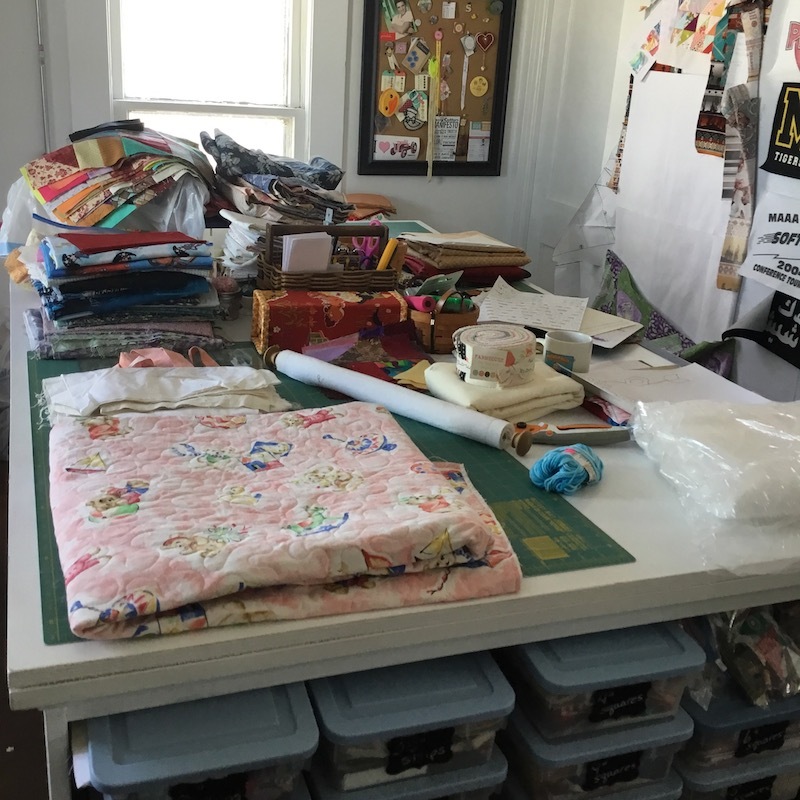 Sogladto hear that your batting cleanup didn’t take as long as you thought….I’m planning on working on measuring and marking my batting and quilt tops today. I have been imagining it’s going to take more than one day…I’ll be thrilled if I can finish it today, let alone in a few hours. I am so slow! 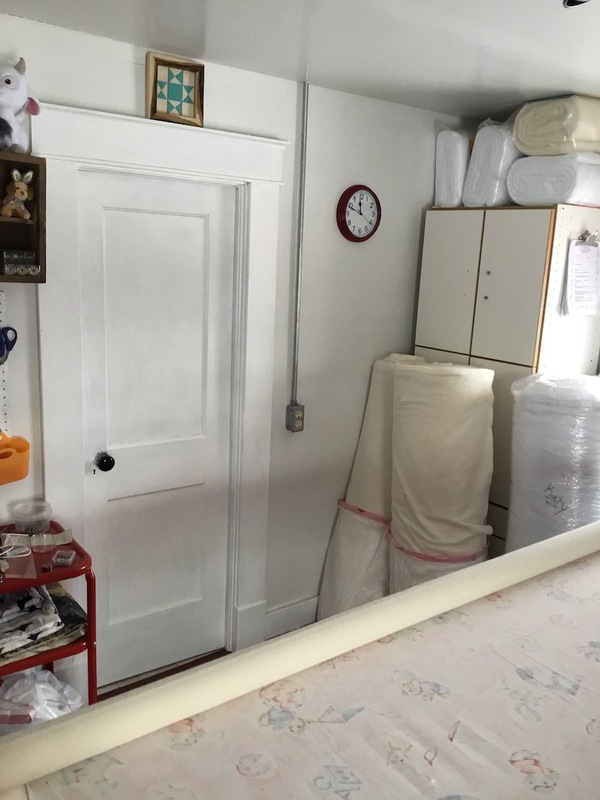 I think a batting closet would be great for rolls of batting with rods to put the batting on, like fabric in the upholstery dept. Doors have to open out though and probably wouldn’t hold anything else. It’d be great to just roll it out and cut off. I like stuff stored out of sight, but I have too much and like you it doesn’t fit. I have rolls of batting in extra bedrooms, the garage and long arm room! Sales on batting get me. I need to quilt faster! You are all inspiring! In my January organizing frenzy I put away, in a very good spot evidently, my odd large pieces of flannel that I use for the back of orphan block quilt as you go quilts. Now I can’t find them and all my mind sees is the bag that was under the table–ugh! I need a floor plan “you are here” directory, now. But, sure am enjoying the cleaned off cutting table! And I too am trying to trim up into my personal scrap saver system before piling up the scraps to think about later. My question is, friends of Prairie Moon–if we all stay so focused—-what will we do with the end of year organization challenges? I so enjoy this site! My project for January was cleaning off the cutting table and then I went on to re organizing the shelves and had it looking really nice. Then I went and looked at the new apartments in town and decided I was ready to leave my home so now the fabric is all in piles over there. 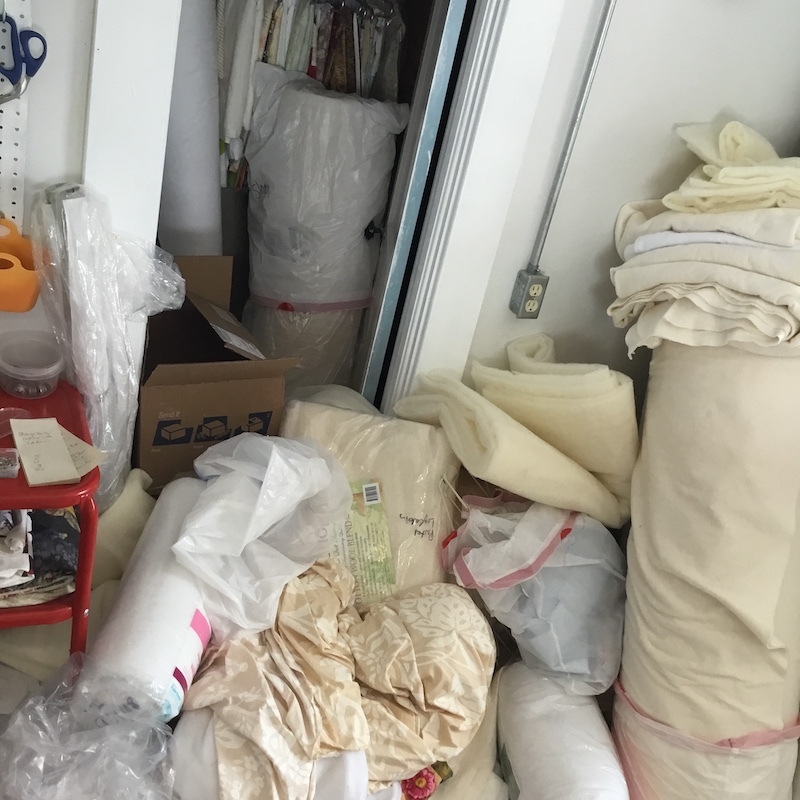 I am excited about my new adventure and I am going to go through the fabric as I put it back on the shelves and set aside fabric to donate. I can’t use all that I have if I live to be two hundred years old! This is your studio, not a bedroom for relaxing where clutter is disturbing. Just open the batting closet door and put the big rolls in. It won’t hurt anything to see the inside of this closet..have never heard of closet doors opening inward!! Drunk contractor?! We are big fans of pocket doors, because they take up no room in either room. Unfortunately, you aren’t going to be able to accomplish that without major wall work. We also really like sliding – or in our case – barn doors. I’m not sure about leaving that moulding at the top of the door frame because it’s not flat, but I think you could leave it on the sides of the door frame. It’s relatively easy to put up the track, and hang the door. We didn’t like most of the barn door hardware we see in the stores, but there are lots of nice ones online – including horseshoe shaped, which we have on the door leading from our bedroom into our master bath. There are also so many door designs. Look online. Relatively easy solution and looks great. What do you think?